You know you have a challenge on your hands when you’re responsible for Mac computers distributed across nine schools, in three towns, all using varying bandwidths, and becoming increasingly mobile. This challenging environment can be found in the Lakeland Catholic Schools district of Alberta, Canada. The weight of this challenge falls squarely on the shoulders of Glenn Nowosad, Lakeland’s Director of Technology. 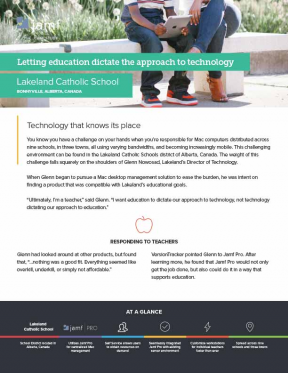 When Glenn began to pursue a Mac desktop management solution to ease the burden, he was intent on finding a product that was compatible with Lakeland’s educational goals. VersionTracker pointed Glenn to Jamf Pro. After learning more, he found that Jamf Pro would not only get the job done, but also could do it in a way that supports education. Glenn is also going to use Jamf Pro to help recruit his PC technicians for added Mac support. “Terminal scripting is built into Jamf Pro, so we’ll be able to increase our maintenance efficiency by having our PC guys help on the Mac side,” said Glenn. Because the district relies so heavily on its Mac computers, improved support and maintenance equates to improved classroom environments for teachers and students. Glenn wanted technology to serve education—Jamf Pro is doing exactly that.